Dr. Ledesma’s family legalized in 1986 with the passing of the Immigration Reform and Control Act. He then went on to get his undergraduate and graduate degrees. He worked with an organization within UC Berkeley that assisted immigrant students. The author wrote that not every student was ready to come out publicly. He recognized the pressure to confess who they were “via ever increasing gut wrenching stories” to get support from the university. 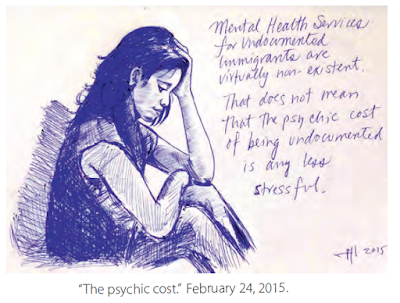 Dr. Ledesma noted that it was important to recognize many of these students were still processing the psychological repercussions of their undocumented life on their identity. Even fully legalized the author wrote that grappling with the emotions of being undocumented, even for someone who has now spent decades enjoying the benefits of naturalized citizenship, was no easy matter. This novel seems to be a part of his process. He told me that if he could help one or two readers embrace the complexities of undocumented life, the effort would have been worth it. I'm grateful this book insisted on creating itself, as he wrote and that it found its way to me. The author wrote about his daughter and slowly ceasing to hide his drawings from her. He talked about an awareness building in her about her family’s history. Then he told her, maybe surprising himself, that he was once undocumented. What I loved most about this book was the author’s recognition (and actually seeing the words on the page) that the state of undocumented-ness has a psychic cost. 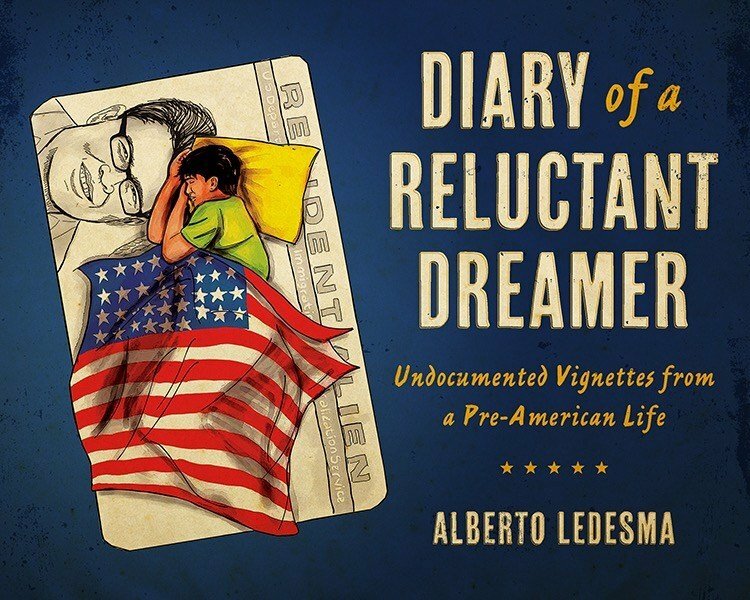 He wrote that unless his work was published, the notion that undocumented immigrants are brain dead parasites incapable of intellectual and ethical reflections regarding their social, political and historical condition in American society will persist. And, unless these ideas are challenged, undocumented immigrants will continued to be regarded as machinery devoid of spiritual or intellectual worth. I like how Ledesma’s book is both a narrative about his life an also outside of it. 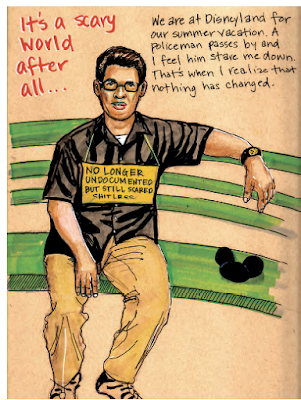 The narrative is his life but the sketchbook format presents the other legislative and economic factors that affect an undocumented life. 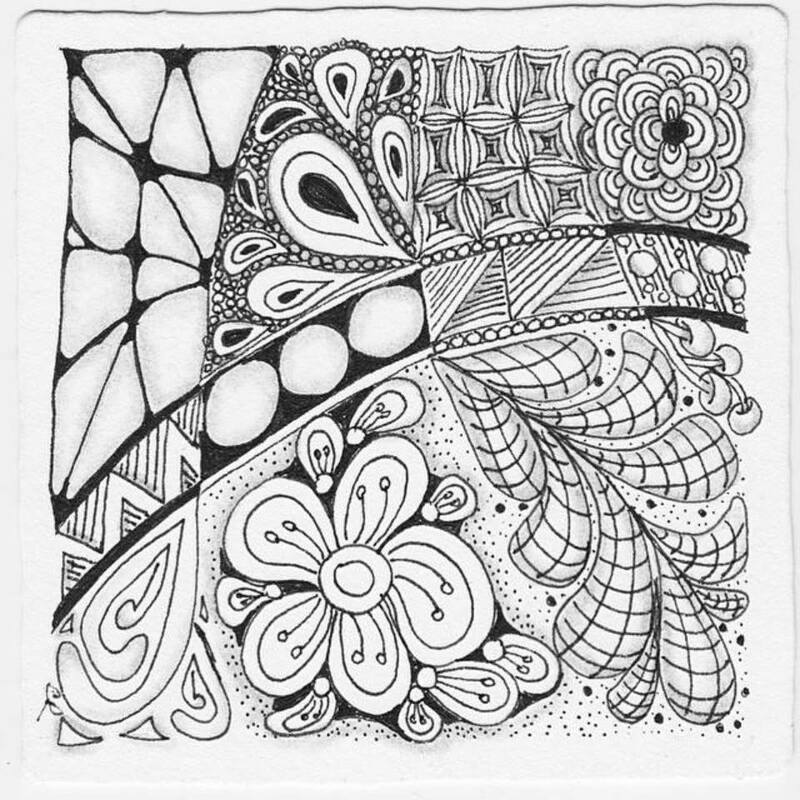 The ideas are quilted so someone like me with an undocumented past can process the experience visually. Similarly, somebody with no firsthand knowledge of being undocumented can step inside to understand a different narrative of the American experience.